Lots of press lately about an innovative and, it appears, fun exercise led by Professor Bill Henderson of Indiana University's Maurer School of Law and Anthony Kearns of the Australian lawyers insurance operation, to envision the potential future of BigLaw. The role-playing game, called FutureFirm, encouraged participants to outline what a new law firm model might look like, given the state of the economy, client push back on the billable hour, the commoditization of legal services, and so on. Participating law students vied for a cash prize of $15,000, which was generously contributed by prominent legal consultancy, Hildebrandt. I applaud the innovation, as readers of this blog well know that I am all for improvement in the practice of law, particularly in the BigLaw space. It's also about time we educate our law students on more than critical thinking. So many leave law school with no idea how to practice law, let alone how to counsel business managers on commercial issues. Ron Friedmann, one of the wisest observers of the day, points out the irony of the sponsorship by a "large and long-serving consultancy serving BigLaw" The implication is, if you're able to guide law firms through an uncertain future, why are we in the state we're in? This is a bit unfair. As any consultant knows, you can only make the recommendations, you can't force the client to execute. But BigLaw in particular is challenged by a certain myopia. In a precedent-based and risk-averse profession, where what others have done is often sufficient rationale for me to take the same course (see: associate compensation, layoffs), many lawyers don't know what they don't know. Until someone else goes first, they are at times unable to envision a future substantially different than the present course. So even progressive consultants can be stymied by an unwilling audience. Indeed, my own organization some time ago predicted the changes taking place today. My colleagues have spent quite a bit of time educating law firm leaders about the changing climate, and offering counsel on how to adapt. 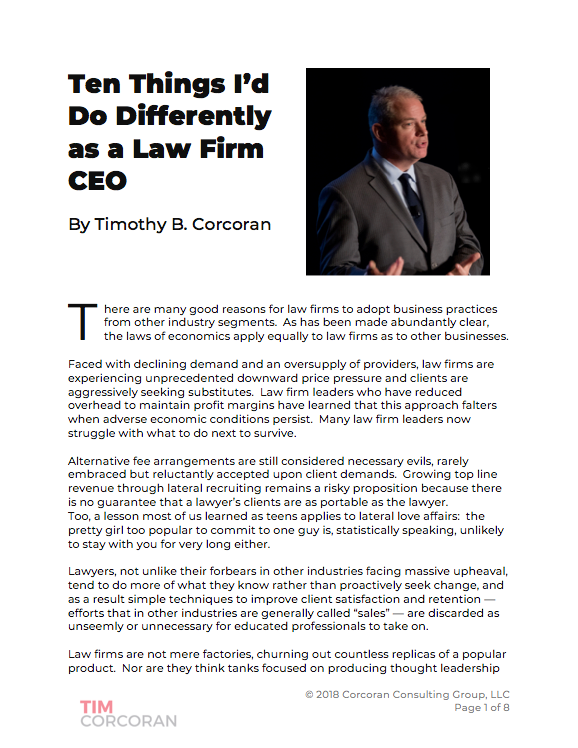 I'm confident there are thought leaders in other consultancies trying valiantly to raise awareness and help guide law firms to an improved future. But Ron's point is well-taken. During my courtship by several law firm management consultancies, I met one of the culprits who, if not harming, was certainly not helping law firms adapt to the changing times. When presented with my credentials, which include leading global businesses larger than most law firms, a couple decades providing business development services to law firms, including a role at a global law firm, and a deep understanding of in-house counsel buying habits, she was mystified. "What in the world could you possibly know about law firms? I really don't see how you could contribute to our practice, given that you aren't presently engaged in law firm consulting." Exactly right. I would not fit in well in an organization devoted to maintaining the status quo. But as law firm leaders have undoubtedly noticed, the status quo is not a growth business.